A 'Scan to SharePoint Folder' App allows your users to scan directly to a predetermined SharePoint document library (folder). It has no options for browsing to other SharePoint destinations. This App is very efficient for repetitive workflow operations because it avoids the extra step of selecting a SharePoint folder for each scan. If you want to choose the SharePoint destination folder at scan-time, see Create 'Scan to SharePoint' App. 5.In the “General” tab, give this new app a name and make sure the “Status” is enabled. You can also set whether to stay within the app or return to the Udocx main menu between each scan operation. 6.Select the “Application” tab and specify the URL of the SharePoint site. The "Site" field is the URL of the SharePoint site. You can retrieve this link from your browser (see the knowledge base article Determining Your SharePoint URL for more information). When using the Udocx form recognition feature, the 'Fields' button will allow you to incorporate field data into your site URL. The "Folder" field is the subpath that will be appended to the site URL. You can retrieve the folder name from your browser (see the article Determining Your SharePoint URL for more information). When using the Udocx form recognition feature, the 'Fields' button will allow you to incorporate field data into your site URL. Note: Udocx cannot create SharePoint folders. When utilizing field data to build the routing URL, it is important to configure an error route to handle unexpected form data (see below). The "Notify" option will send an email to the current user to verify the operation. You may configure a folder to use for routing when defined route fails. This is particularly useful when your site or URL includes field data from the Udocx form recognition feature as unexpected data can result in an invalid routing URL. You may configure the file name based on explicit text + a GMT date/time stamp or accept the default generated file name (Scan_GMT date/time). You may adjust the permissions of the user within this app. The user will not be able to modify the attachment file name or disable the notification unless these options are checked. 9. Click [Save] to confirm the App, which will take you back to the App overview. Note: The "Column Settings" tab allows you to import or manually define metadata columns within your SharePoint document library. This tab is not available until the App has been saved. It is recommended to complete the basic configuration, save the App, then edit the App to add/import columns as needed. 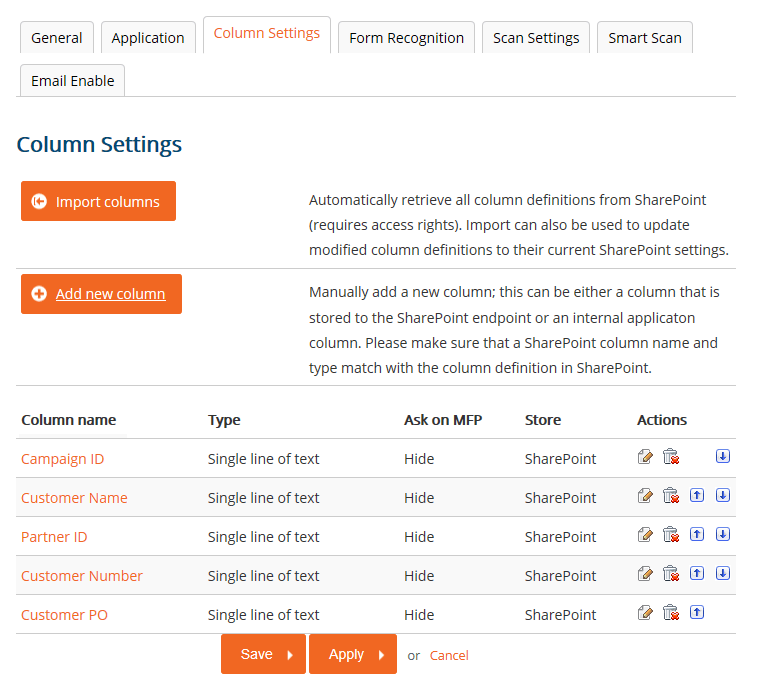 If you have custom SharePoint columns that you wish to modify from within the App, you may import them from the 'Column Settings' tab at this time. 10.Click on the 'Form Recognition' tab if you wish you use form recognition to set the SharePoint URL or populate meta data columns within the SharePoint document library. 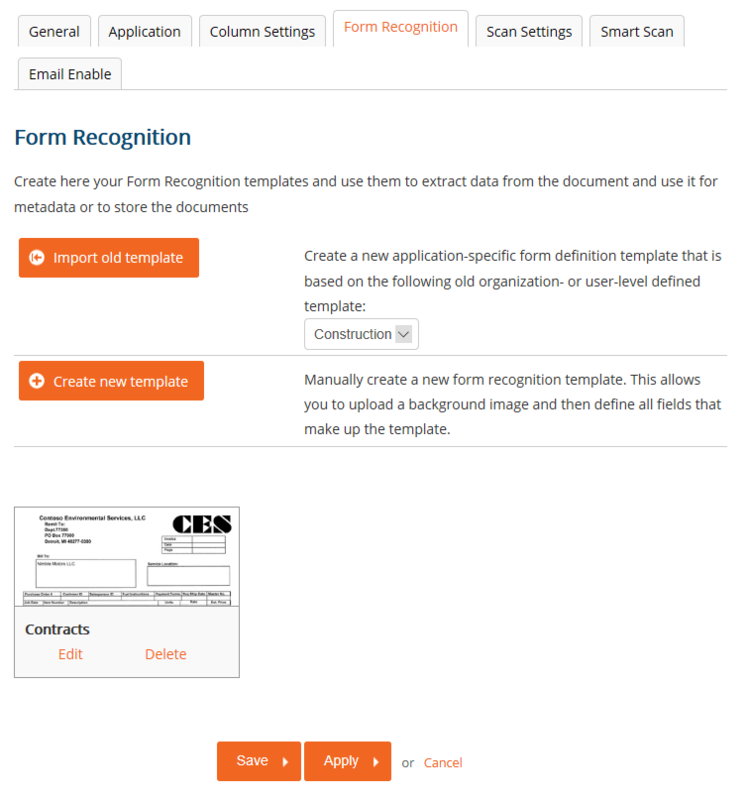 The configuration of Udocx form recognition always begins with the creation or importation of a form recognition template. 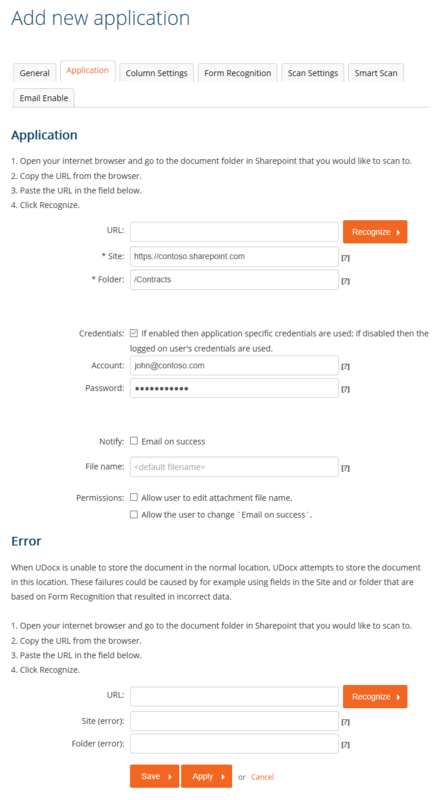 This is when you upload an example form and define the relevant data areas. Once form recognition has been configured, you can use the captured data to populate SharePoint meta data columns, use the data to build the destination SharePoint URL, and/or construct the filename of the document. ​11.Click [Save] to complete the App configuration.